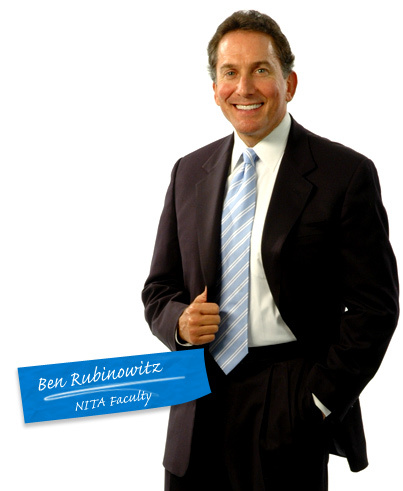 Our managing partner, NYC personal injury attorney Ben Rubinowitz will be directing the “NITA Drills: A Witness Examination Boot Camp” from April 29 to May 1st 2019. This program will take place at The National Institute for Trial Advocacy Education Center in Boulder, Colorado. The Witness Examination Boot Camp is a rapid-fire, three-day program that focuses on direct and cross-examination of witnesses, including impeachment and expert witness variations, as well as methods for delivering killer openings and summations. NITA’s groundbreaking “learning by doing” method ensures you’ll master new skills you never even knew you were missing. You’ll learn not only how to formulate great questions on the spot through muscle memory, but also how to think quickly and effectively on your feet—and the investment you’ve made over just a few days’ time will pay off the instant you step back inside the courtroom or take your next deposition. Taught twice a year by highly experienced trial lawyers, members of the Inner Circle of Advocates, American Board of Trial Advocates and NITA’s Board of Trustees, the boot camp is limited to 24 participants to maximize the opportunity for every attendee to drill his or her skills. It usually books quickly so don’t wait too long to reserve your seat.